Auto Tables for RAD Server is a powerful automation solution that allows you to automatically generate a REST API in Delphi 10.2 Tokyo. It will take a look at your existing database tables and automatically create the CRUD code for adding, editing, and deleting records from the existing database via a REST API. You can literally deploy a REST client and server solution for an existing FireDAC supported database in a few clicks. The REST API is deployed as a RAD Server. Auto Tables for RAD Server is similar to other solutions like DreamFactory, Sandman, and LoopBack. 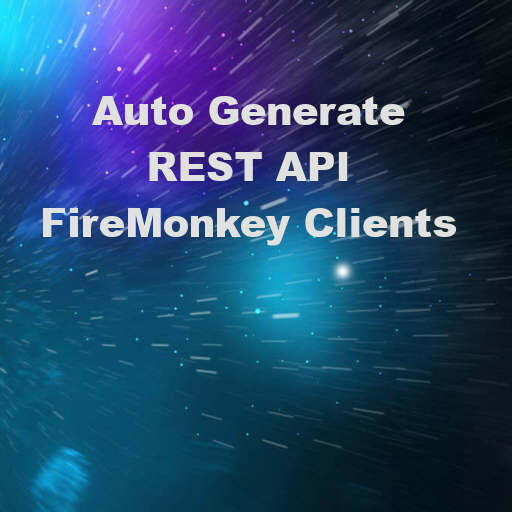 Once the server is generated it also generates a FireMonkey client for accessing the REST API. The Delphi FireMonkey client should run on Android, IOS, Windows, OSX, and Linux (with FMXLinux). There are actually three separate ways generated to access the REST API that you create. The first is a Delphi project with a DataModule suitable for building a FireMonkey client and leveraging LiveBindings to quickly build out the UI of your client. The second way is through a code only Object Pascal SDK that is generated for your REST API. Lastly, an OpenAPI spec file is generated that defines the endpoints in your API. You can use the OpenAPI spec file to generate all kinds of other clients for the REST API using either SwaggerHub or OpenAPI CodeGen. The Auto Tables for RAD Server project is free and open source using an MIT license. The project has extensive documentation and the REST API is packed with features like paging, custom queries, and aggregate queries for building dashboards. Additionally, it supports setting up enterprise grade permissions through RAD Server. You can probably also use the generated SDK in your C++Builder clients. At the time of this writing a RAD Server license is included with Delphi Enterprise Edition and up. Head over and download the full source code for AutoTablesForRADServer and generate your REST API in seconds.